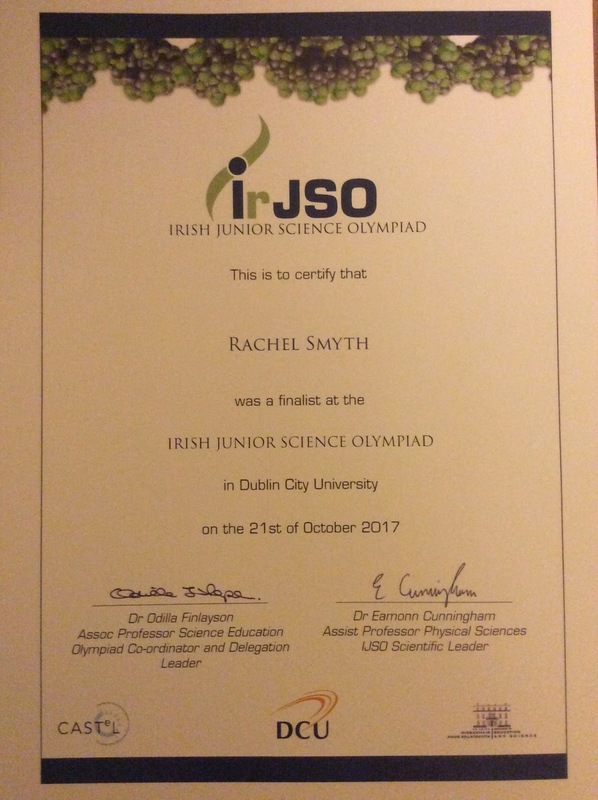 On Saturday 22nd of October, I attended a science exam for the Irish Junior Science Olympiad. Not many people have heard of this, and I hadn’t either until I received a letter, inviting me to participate in the competition. The students with the top one hundred maths and science results in the country were permitted to enter the competition. The winners would then travel abroad to represent Ireland in the International Junior Science Olympiad. Before the exam, I was a bit nervous because I didn’t know what to expect. After researching the exam online, I found out that the standard would be of Leaving Certificate pass level. I didn’t know what to expect, so I just looked over a few junior cert questions for the week before. The exam was in DCU. When I arrived on Saturday, with my friend who was also selected, we were sorted into two lecture halls. There were students there from all over the country. The exam was two and a half hours long and covered Biology, Chemistry and Physics. The questions were unlike any Junior Cert or Leaving Cert questions and were based on using logic to work out the answers. I found it difficult but was able to answer most of them. Everything was multiple choice. Afterwards, there was a break for lunch and then there was an awards ceremony. Everyone received a certificate for being a finalist in the Olympiad. Awards were then given to three bronze, three silver and three gold medalists. The overall winner was also announced. The silver and gold medalists qualified to go to the Netherlands to compete in the International Competition. I’m glad I competed in the Olympiad and though I was not very interested in maths and science before, it has opened my mind to possibly working in science in the future.